Demigod Games is a small boutique tabletop miniatures and game design company based in Orange NSW Australia. Our aim is to bring the gaming community high quality miniatures and fresh game play experiences. Demigod Games develops products for gamers by gamers. Our passion comes from a love for the tabletop gaming hobby and that passion is expressed in the quality of the products we are developing. would you like to know more? Check out our about us section. Conquest of the Gods is an upcoming historical fantasy tabletop wargame by Demigod Games. Conquest of the Gods melds history, cultural mythology and fantasy to give tabletop wargamers a fresh new take on popular historical mythology. Players take control of powerful armies populated with historical units, hero’s and mythical creates. You may even find the odd god or two amongst our model range that are making their way into Conquest of the Gods! To learn more about our flagship product, delve deeper into whats in store for Conquest of the Gods. Whats on the way from Demigod Games? 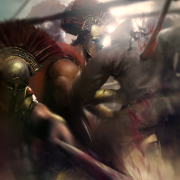 Aside from developing our flagship game ‘Conquest of the Gods’ and an amazing range of high quality gaming miniatures for it, we are presently exploring the option launching a crowding campaign. Such a campaign will allow us to move the development and release of Conquest of the gods forwards and get this high quality game into your hands sooner without compromising on quality.